Do finals have you stressed out? Are you tired of taking notes? 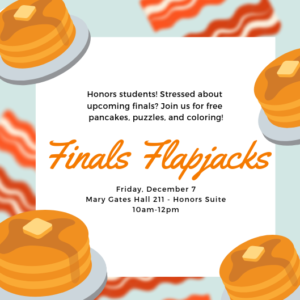 Stop staring at stacks of those assigned readings, and come join Honors in eating stacks of flapjacks! Your Honors Community Ambassadors are hosting a pancake breakfast in the Honors Suite, Mary Gates Hall Room 211, this Friday, December 7th from 10am to 12pm. Please drop in and grab a bite to eat before going back to studying for finals, or stay a while and enjoy the fun activities we have planned as well.